Even common trees are amazing enough, but some trees are just spectacular, whether by their sheer size, age or shape or through mysterious properties they seem to possess. There’s the tree that serves as the single sign of life in a vast barren desert, the ones as old as dinosaurs and the almost sinister yet beautiful trees that snake their roots through ancient temples. There are undoubtedly hundreds of magnificent tree specimens in the world, as there are so many fascinating and visually stunning forests, but here is a selection of 15 particularly incredible trees that are nothing short of breathtaking. Upon approaching the world’s largest cashew tree, you might think you’re entering a forest. But despite covering about 8,500 square meters, it is indeed a single tree. The 117-year-old tree, which is 80 times larger than an average cashew tree, has become a bit controversial ever since its roots started taking over a nearby highway, only allowing one car to pass at a time. Specialists fear it might die if trimmed. It currently takes up an area larger than a soccer field and bears 80,000 fruits per year. The Chêne-Chapelle, or Chapel Tree, of Allouville-Bellefosse is more than just a tree – it’s also a religious monument and a building. Already 500 years old in the 17th century, the tree – which had been hollowed out by a lightning strike – was made into a chapel with a small altar to the Virgin Mary by the Abbey of Detroit and Cerceau. An additional chapel and staircase were added later. Today the ‘Chapel Oak’ is France’s most famous tree, and people struggle to protect it, covering damaged portions of its bark with wood shingles and supporting it with poles and cables. Despite their best efforts, however, the tree may not last much longer – the crown is becoming smaller and smaller as each year passes. The ‘Wawona’ tree, the most famous among the Mariposa Grove of Big Trees in Yosemite National Park, stood at an incredible 227 feet tall. It was 90 feet in circumference, and a hole big enough for park visitors to drive through had been cut in the base where it had sustained a fire scar. As such, it’s often called the ‘Drive Through Tree’ or the ‘Tunnel Tree’. Unfortunately, the Wawona tree fell in 1969 under an estimated two-ton load of snow. It was approximately 2,300 years old. Baobab trees may be the oldest life forms on the African continent, and many that are still standing today have been around since Roman times. They’re leafless for most of the year, and their thick, bloated, fire-resistant trunks store water during the dry months. Some baobab trunks are so large that people live inside them. Arabian legend about the baobab says “the devil plucked up the baobab, thrust its branches into the earth and left its roots in the air”. This particular specimen, located in Madagascar, is referred to as the ‘Teapot Baobab’. It’s tough to get a sense of just how large the General Sherman tree in Sequoia National Park really is unless you see it in person. Photographs hardly do it justice. General Sherman is considered the largest (though not tallest) tree in the world, and it’s also the most famous. It stands at just under 275 feet tall, and the base of its trunk measures 102 feet in circumference. In 2006, its largest branch – itself bigger than most trees – fell off, but considering its height and trunk volume, even that didn’t affect its status as largest tree. In Oaxaca, Mexico stands a gnarly, knotted, gigantic cypress known as the ‘Tule Tree’. At 2,000 to 3,000 years old, it’s one of the oldest living things known on earth, and some say it’s the world’s largest single biomass. Its trunk measures an astounding 164 feet in circumference. The Mixe people of the region believe the Tule Tree to be the walking stick of one of their gods, which took root and grew to the amazing size it is today. The temple of Ta Prohm, in Angkor, Cambodia, is still best known for the trees that snake their roots through it, despite its high-profile appearance in the ‘Tomb Raider’ movie. It’s a beautiful example of nature taking spaces back after long periods of human absence, with silk cotton and strangler fig tree roots seemingly wandering over the structures in search of soil and water. The place has an eerie and romantic feel, making it a favorite destination for tourists. Cambodian officials have decided to leave the trees alone to preserve the atmosphere of the temple. Though unique and beautiful, the interesting qualities of the Wollemi Pine lie not in its looks but in its history. 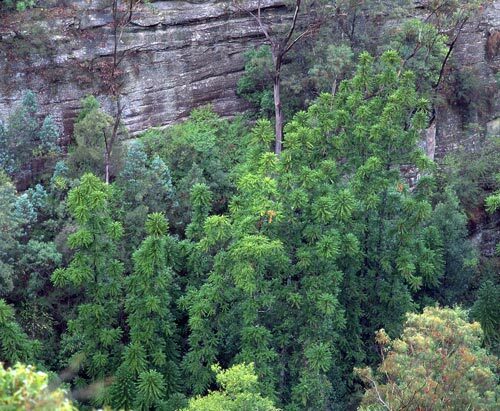 The Wollemi Pine is a “living dinosaur”, and was nearly extinct before it was discovered in Sydney, Australia in 1994. Now called “the crown jewels of the botanical world”, the Wollemi pine had previously been known only from a 120-million-year-old fossil. Very few exist in the wild, but conservation efforts have led to thousands being grown in nurseries all over the world and tree enthusiasts are encouraged to purchase them to grow in their own yards. The Dragon Tree at Icod de los Vinos in Tenerife, one of the Canary Islands, is quite an unusual specimen. It has been said to be between 650 and 1,500 years old, though experts can’t say for sure since it doesn’t have a single trunk, but rather many small trunks that cling together as they grow upward. It has a dense umbrella-shaped canopy of leaves and gets its name for the resin that is secreted when the bark or leaves are cut, which is said to be the dried blood of dragons and was used in ancient times as a cure for various ailments.